Eclipse, the second DLC map pack for Call of Duty®: Black Ops III, arrives first on PlayStation®4 on April 19th, delivering the next chapter in the Origins Zombies experience and 4 new action-packed Multiplayer maps, including the re-imagining of the Call of Duty: World at War classic, Banzai. Our heroes find themselves stranded on a remote Pacific island which is home to the Division 9 facility: a secret biological research lab whose experiments with Element 115 and its effects on human, animal, and plant biology has created horrors beyond belief. Explore the island’s diverse environments from lush, tropical forest to the stark, overgrown laboratory facility using zip lines or the sewer systems to evade the Zombie horde. 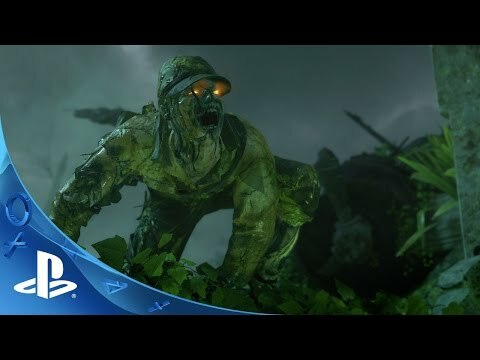 Zetsubou No Shima features new terrifying Zombie enemies, more devastating traps and classic Zombies side quests that will bring more clarity to the Origins narrative as our heroes continue on their mission to prevent the Zombie apocalypse. Battle through four new Black Ops III Multiplayer environments, including Verge, a re-imagining of the Call of Duty: World at War Multiplayer classic, Banzai, set in a post-apocalyptic desert as teams fight over the last water source, and Knockout, a martial arts tournament with a seriously retro 70s twist. In this re-imagination of the classic Call of Duty: World at War map, Banzai, Verge drops Multiplayer combat into the center of a distant post-apocalyptic future, where two warring factions are entrenched in constant battle over one of the few remaining water sources. Take control of the key bridge, fortresses, tunnel systems and waterfalls as you engage in high-speed action through this medium-sized map. Takes Multiplayer combat to a futuristic sub-orbital airport terminal set high in the clouds. Multiple levels and open areas promote intense, mid-range combat around a clean, high-tech civilian environment. Watch your step, because one wrong move could send you plummeting back through the stratosphere. Housed in a traditional Shaolin Temple with a retro twist, Knockout sets the stage for a bloody Kung Fu tournament … with guns. This mid-sized map showcases a sharp contrast between the mid-range engagements outside the temple and tight close-quarters in an eclectic 1970’s styled interior. *Eclipse DLC content not available on PS3. DLC Season Pass and DLC Map Packs may not be available on all platforms or in all territories. Pricing and release dates may vary by platform. Call of Duty: Black Ops III game required; sold separately.